This healthy vegan roasted cauliflower dip is packed with the toasty, warm flavors of hazelnuts and smoked paprika. Use any leftovers as a sandwich spread. Afternoons are deadly for me. Or rather, for my waistline. Right around 3pm, any caffeine in my system has worn off, my brain is fried from being on the computer or photographing recipes and the kids are asking for help on homework that requires me to dig back into the recesses of my grade nine algebra memories. All of that adds up to low willpower thresholds, which inevitably leads to cheese and cracker overload. To avoid that slippery slope, I’ve been loading up the fridge with whichever veggies grab my attention that week. This week it’s cauliflower, zucchini and mushrooms. Sautéed with eggs, tossed in a puttanesca sauce and transformed into baked veggie fries. But for an afternoon snack, I’m all about quick and easy dips. Usually that equates to some sort of hummus-inclusive snack, but this time I branched out to the roasted cauliflower dip, inspired by my recent overzealous adoration for all-things-cauliflower. There’s nothing complicated about making this dip. 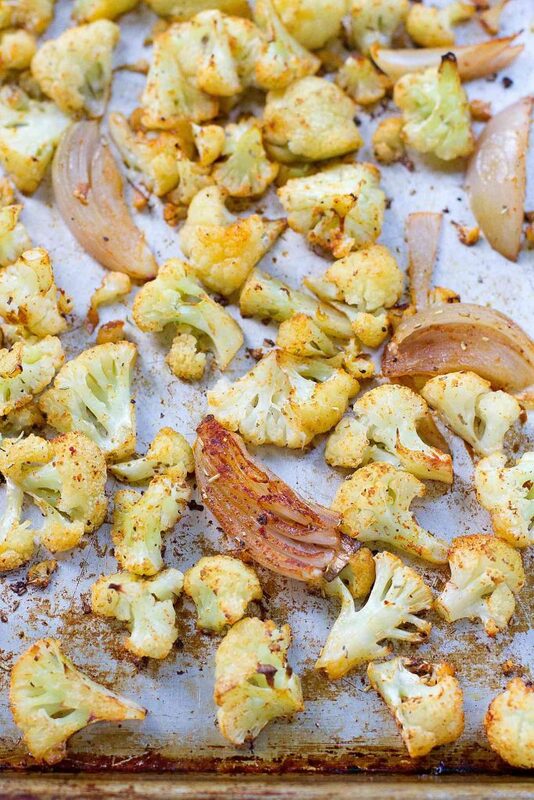 The cauliflower and a sliced shallot are tossed with some olive oil, smoked paprika and crushed rosemary, then roasted in the oven until tender and starting to brown. The cooked veggies, some toasted hazelnuts and olive oil are pureed in the food processor until smooth. 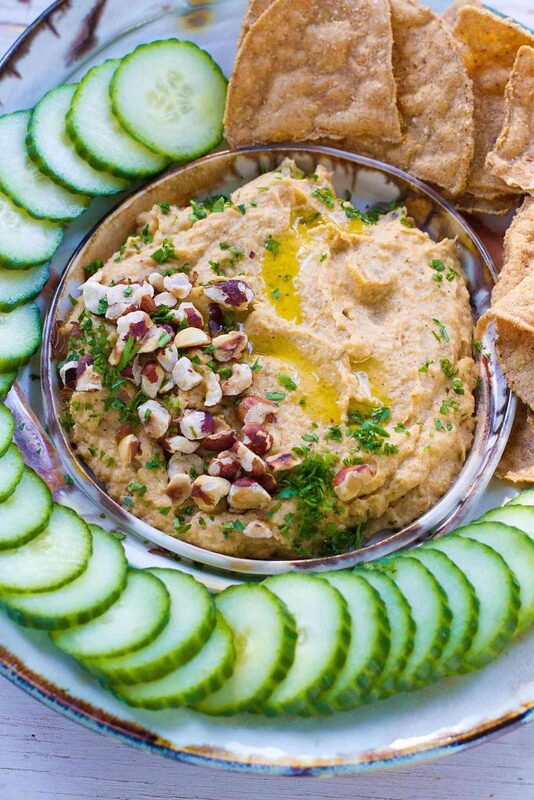 I used cucumber slices and a few baked tortilla chips to scoop up this delicious roasted cauliflower dip, but carrot and celery sticks or pita wedges would be great, too. The leftovers are fantastic as a sandwich spread! In a large bowl, combine the cauliflower florets and shallot pieces. Add 1 tablespoon olive oil, smoked paprika, rosemary, ¼ teaspoon salt and peppers. Toss gently to coat. Transfer to the prepared baking sheet. Roast the vegetables until the cauliflower is tender, turning halfway through, 20 to 25 minutes total. Let the vegetables cool slightly, cut the roots off of the shallot pieces and transfer to a food processor. While the vegetables are roasting, lightly toast the hazelnuts in a small skillet set over medium heat. Stir frequently and keep an eye on the nuts so they don’t burn. Add 2 tablespoons of the hazelnuts to the food processor, along with the remaining ⅛ teaspoon salt. Puree the mixture until almost smooth. With the food processor running, drizzle in the remaining 3 tablespoons olive oil. Transfer the dip to a serving bowl, garnish with the remaining tablespoon of olive oil and parsley. Serve with raw vegetables, pita triangles or tortilla chips. OK this is freaking awesome. I Love cauliflower anything, but have never tried it as a dip! I’m fascinated. Could a different type of nerve used if necessary? This looks amazing, but I have one that’s not fond of hazelnut. MY be toasted almonds? Any ideas? Toasted almonds would be wonderful, Denise! Pepitas would also be another good option. 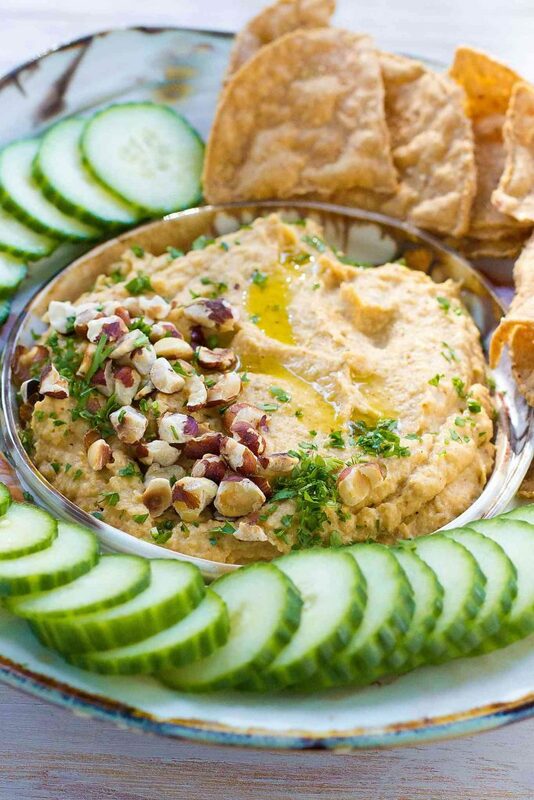 I love cauliflower but I never thought of using it in a dip… So creative! Oh my goodness!! This looks absolutely amaaazing!! YUM!! Yum, yum, and yum! I love everything about this dip and can’t wait to try it! Great recipe, Dara! What a genius recipe…I love cauliflower but have never thought to do THIS with it! My mother-in-law loves cauliflower – can’t wait to make her this the next time she visits! Have nut allergies can you leave them out or substitute something else? If you don’t have any allergy to seeds as well, pepitas (raw pumpkin seeds) or sunflower seeds would be a good substitute. Otherwise, I would just leave out the hazelnuts.